allround geek: Wing Commander: Privateer. Who needs Eve Online? Wing Commander: Privateer. Who needs Eve Online? I got out of the jump point into an asteroid field. My radar started blinking with red marks. 3 pirate centurion ships were blocking my way while shooting at me. I quickly lock on the middle target firing two missiles. I hit my afterburner and at the same time and steer to the left to avoid the incoming fire. Soon there were two pirates left and I was dogfighting amidst asteroids. They really wanted my cargo but I wanted to avoid being sucked into the void even more. I hit the afterburner making a run for it. After two nav points I reached an agricultural planet where I sold my cargo for a, well deserved, amount of money which I used to buy some new tachyon cannons for my ship. While in the Merchants Guild office to enlist for a new mission I heard the voice of my girlfriend standing behind me..... "What's this ugly looking crap of a game that you are playing?" Welcome to the world of Wing Commander: Privateer. It all started with Elite, the granddaddy of space simulators. It was an 8-bit heaven of space travel, bounty hunts, piracy and intergalactic commerce. 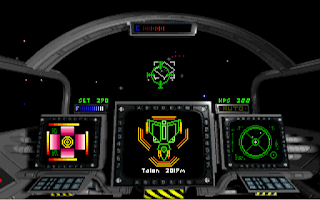 Fast forward to the early 90s Origin Systems took the old recipe, added SVGA graphics and the Wing Commander universe and gave us an amazing game. You can use the money to upgrade your ship with stronger weapons, more shields, better armor and much more. You can even buy a newer ship more suited to your carrier. For example, you can get a ship with larger cargo space to move more goods, or a faster fighter for your dogfights. The game uses the Wing Commander 2 engine to bring us some beautiful graphics that really help to build up the space atmosphere. Most of your time in the game will be spent on the cockpit traveling and fighting but you will visits planets and space stations as well to equip your ship, buy or sell goods and get new missions. This game was recently re-released from GOG tuned to run on modern equipment. It costs just 5.99$ and for the dozens of hours of fun it offers it is a steal. For those of you that agree with my girlfriend about the graphics there is a free open source remake of the game with a new engine that offers 3d graphics and out-of-the-box support for modern operating systems., now if you 'll excuse me I ve got a shipment to smuggle into a system with really tight security. Ahh, Privateer...such good memories. I don't suppose you know of anywhere I could source a poster from would you? I apologize but I am not really sure I understand your question....what do you mean by 'source a poster'? I an using. HTC magic. version 1.5 how to upgrade it to 2.2 or any other plz tell the way to upgrade my phne and mail it on drpritpalsingh1@Gmail.com.